vmcse is a port of Virtual MCSE 2.0 to the PalmOS platform. This is funded even less than the original project, so I’d appreciate any patches for increasing the skillset of this program. The Virtual Microsoft Certified Service Engineer is a highly sophisticated AI application that will help you solve your problems with any Microsoft Windows computer. To use the Virtual MCSE, describe your problem at the text input, and press the “Consult” button for a solution. Hit the “New Problem” button for further consultations. If you know which version of Windows you are running, the Virtual MCSE AI may be able to generate more accurate answers. However, if you do not know the answer to this question, the Virtual MCSE will still try to find a useful answer. 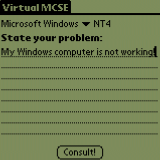 Note: Microsoft Windows CE is not yet supported by the Virtual MCSE! vmcse is released under the GNU General Public License. The latest version of vmcse can be found here. Source code is in the tarball, precompiled binaries for the Palm are in the zip.